Senior police officer Muneer Ahmed Khan said the attack occurred as the convoy reached Pampore on the outskirts of the disputed region's main city of Srinagar. He said one bus was destroyed and at least five other vehicles were damaged by the blast. Khan said soldiers and counterinsurgency police reinforcements were deployed in the area. Sanjay Sharma, a spokesman for India's paramilitary Central Reserve Police Force, said many of the injured were in critical condition. "The blast was so powerful that one cannot recognize whether the vehicle was a bus or a truck. Just pieces of mangled steel remain of the vehicle," he said. 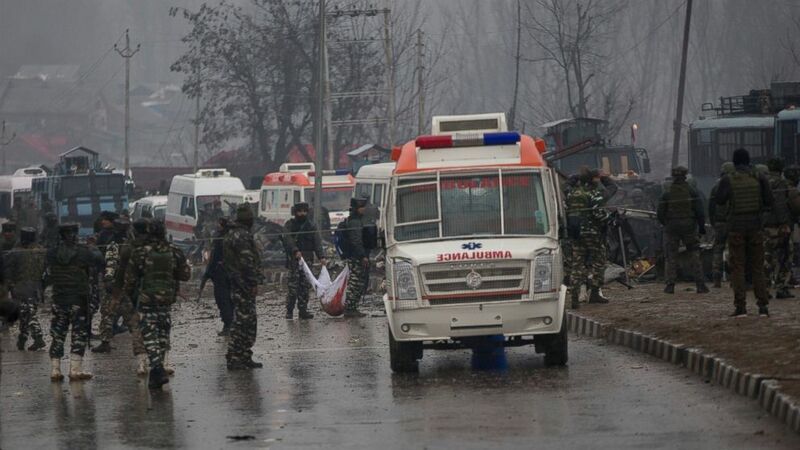 The Greater Kashmir newspaper reported that militant group Jaish-e-Mohammed claimed responsibility for the attack. It quoted a local news gathering agency as saying a militant rammed an explosive-laden car into the convoy. Kashmir Gov. Satya Pal Malik accused Pakistan of guiding the attack. "Visibly it seems to be guided from across the border as Jaish-e-Mohammed has claimed responsibility," Malik said in a statement. "Such actions will not deter the resolve of our security forces ... we will finish these inimical forces to the last."